Zewede is someone we have helped in the past. He has a wife and young 3 year old daughter. Last year we left £30.00 with Zewede as his daughter required an eye operation to correct a deformity in the eye. We were amazed to see the difference the operation had made and he tells us that her sight is perfect. The money not only covered the cost of the operation but also the travel costs and overnight stay. The hospital is a four hour trip by local bus. Zewede has always been very hard working, he runs a small tailoring business and has just opened up a tea shop with his wife. It was not quite Devon Cream Teas but very nice by Ethiopian standards. Sister has a new helper at the Day Care Centre, Eseynat, who is helping the porridge ladies with some basic reading and writing. She has a young daughter Mbet aged about 2 and needed someone to look after her whilst at work. 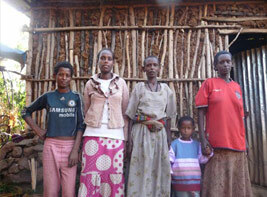 Eseynat contacted her niece Ubalu aged about 11 to come from the countryside to take care of Mbet. It was obvious that Ubalu had had no education and even struggled to tie the laces of the new shoes we bought her. We agreed with Sister that we would sponsor Ubalu and that she could have some basic education now before starting school in September. We would have liked for her to stay at the Day Care Centre for at least a year, but Sister explained that an official visit from the authorities would raise questions as to why a child of 11 was in day care. But it was OK for her to have spent her early years in the country with no education. We will continue to support her when she does go to school. Young Adani has moved from Day Care to the main school this year, we continue to sponsor him and support his family with a small income. It was great to see how Adani has come on. Sister told us he is very bright and lives up to his nickname of the Little Professor. One thing he did need this year was a new pair of shoes as he was running about in a pair of indoor slippers. It is OK having the land but with no tools to dig with, it’s pointless. We purchased some tools - a spade, a scythe, a watering can and a pick. For reasons we cannot fathom the shops sell the heads to tools but not the handles. Yes the famous Two Ronnie’s sketch was played out with the added edge of having a conversation between an Ethiopian and an Englishman. We came away from the shop without the ‘fork ‘andles’, having decided to ask Sister’s cattleman, Tomaskin, as he fixes most things and we knew he would put a suitable handle on the tools…. Half way through the conversation we thought at least the man in the shop spoke some English! weighing about 7 stone, amazing! Sister Terfatu asked Mike if he would pull together a plan for the refurbishment of their living house. A German organization has offered funding for the refurbishment which we have to say is in desperate need. The general décor is OK but the water and electricity is another issue. Not sure you should get a mild electric shock every time you stand in the shower and touch the tap. No one else in the house appears to notice, just the foreigners. Sister arranged for the local handyman to come and give an estimate, which he did. He didn’t bother walking around the house he just gave Sister a price. Mike was not convinced that he had taken all into account as is the Ethiopian way - they give a price and then a couple of days later come back with a higher price. Mike encouraged the handyman to walk around the house and give a price per room, this way he would be able to break down the costs and pull together a plan for the refurbishment. Sister Terfatu, the handyman and Mike walked around the house and a price was agreed per room. They all sat down, haggled for a while, agreed a price and then shook hands. Then just as the handyman was leaving he spoke with Sister Terfatu. She explained to Mike that he needed more money as he had not included the labour costs. There is now a wall in Sister’s house that needs a repair where Mike was bagging his head.